The daily newspapers are now full of stories predicting that Iraq, as we know it, will soon disintegrate into three or more warring states. In the last two weeks Sunni insurgents led by the extremist ISIS have routed a good part of the Iraqi army, taken over much of northern Iraq not controlled by the Kurds, and now are moving close to Baghdad. Despite the dispatch of American and Iranian military advisors to at least assess the situation, most observers say government forces are too weak to drive back the insurgents and retake the lost territory. Washington is refusing to get involved unless the Shiite-dominated Iraqi government makes radical changes in its relations with the Sunnis and Kurds. Our concern here, however, is what all this has to do with the world’s oil supply and, closer to home, our gasoline prices. In recent days we have been told innumerable times that most of Iraq’s oil is way south of Baghdad where it is relatively immune from the turmoil in the north – so there is little chance that Iraq's 2.5 million barrels a day (b/d) of exports will be affected. 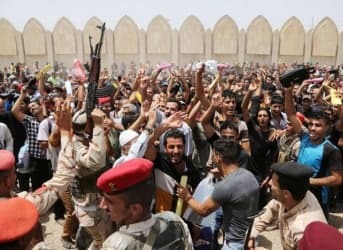 While this may true for the next few weeks or even months, the Sunni resurgence in the north is not a short-term problem and in the past week the ISIS has captured some formidable assets which could bring heavy pressure on, if not strangle, Baghdad. ISIS now has control of one of three major refineries in Iraq which supplies the motor fuel and oil for power stations for the northern part of the country. [As of 6/30/14, control of the Baiji refinery appears to remain in dispute. -Ed.] Lines are already forming at gas stations. The ISIS controls the Euphrates and will likely gain control of the Haditha power dam, which supplies 360 MW to the national power grid. With control of the river dams, reduced flows of water could make life very difficult in southern Iraq before the summer is over. It is doubtful if the thousands of foreign oil workers that are expanding and overseeing Iraq’s oil production would stick around too long. Some non-essential-to-production foreigner oil workers are already leaving the country or moving to safer areas. Another facet of last week’s developments is that the insurgent forces in Anbar province are getting very close to Baghdad’s airport. All it would take would be a few of the howitzers they captured from the Iraqi army and air travel into Baghdad could be restricted. While it may be impossible for insurgent forces even of the fanatical variety to fight their way through thousands of Shiite militiamen to the southern Shiite shrines and oil fields, in a prolonged standoff (and this one has been going on for 1,400 years) serious harm is likely to be done to Iraq’s current and prospective oil production. Some observers are already saying that large increases in Iraqi oil production in the immediate future are unlikely, but as yet few are writing off the current 3.3 million barrels of daily oil production. Let’s assume, however, that before this year or next is out, Iraqi oil exports drop substantially as it has in several other oil-exporting states undergoing similar political trauma. Just what does this mean for the world’s oil supply? With 2.5 million additional barrels of oil disappearing from the market added to the 3.5 million that have already been lost due to lower production in Libya, Iran, Sudan, and Nigeria, the world markets would clearly be stressed. The Saudis could probably come up with an extra million b/d for a while, but that is about it. Iran could sign a nuclear treaty this summer and be out from under sanctions, but it will take a while to develop significant increases in production. Libya, Sudan, Syria, Nigeria and Yemen show no signs of settling their internal political problems and start exporting significantly larger amounts of crude in the foreseeable future. Keep in mind that global demand for oil has recently been increasing at a rate of about 1.2 million b/d or so every year, while depletion of existing oilfields requires that another 3-4 million b/d be brought into production each year just to keep even. Many people, including government forecasters, are looking to increasing U.S. shale oil production and more deepwater oil from the Gulf of Mexico to keep the world’s supply and demand in balance without sharp price increases. Somewhere down the line there may be more oil produced from the Arctic; from Kazakhstan; from off the coast of Brazil; from East Africa; and even significant shale oil production from other than in the U.S. But it will be many years before these new sources can start producing significant amounts of crude, and none of these are likely to make up for any shortages that develop in the next few years. Deepwater oil production from the Gulf of Mexico has been flat recently, and we are starting to get indications that the rapid increases in U.S. shale oil production, which have kept prices under control for several years, may be drawing to a close. The geology of shale oil production dictates that once it stops growing, a rapid decline in production is likely. In sum, it looks as if there will be higher and possibly much higher oil and gas prices coming soon. If ISIS decides that the way to finish off the Shiite “infidels” is by cutting their oil revenues, then a bombing and terror campaign against southern Iraqi oil installations and oil workers would be a likely result. It would not take much to send the foreigners running. The Chinese are already moving out some of the 10,000 oil workers they have in southern Iraq, and others are likely to follow as we have seen in so many other places. Where do oil and gas prices go? The official forecasters are only talking about another couple of dollars a barrel this year, but this is clearly too low if significant shortages develop. Leave us not forget that the legal barriers to Alaska North Slope oil production were cleared away in short order when the US was faced with an oil shortage and gasoline rationing in 1973.President Obama (the Enabler-In-Chief), when faced with a recession turning into a depression decided that the "big banks" were "too big to fail". If we have another oil and gas shortage which threatens a depression, Obama will approve Keystone as a "shovel ready" way to get more energy to market quickly, even if Congress has to approve legislation that stops Nebraska's suits against Keystone. Northern Gateway too. These projects will go ahead in an emergency atmosphere even if demonstrators who engage in civil disobeience must be sentenced to lengthly prison terms and force fed if they hunger strike. Venezuela's tar sands can also pick up some slack. And in the longer term, natural gas clathrates in the deep ocean, which the Japanese are having success developing safely. Where can you find that Iraq exports 2.5 million barrels/day? OPEC has only released 2012 statistics saying 2.4 million. The US DOE EIA has only released 2012 statistics saying 2.2 million. Can you say where 2013 data is or did you just guess based on trends? Mr. Katchen is of course correct about there being other sources of energy which may take up the slack in the beginning of a major oil crunch and that governments are likely to put aside individual rights and environmental concerns in order to provide fuel for a guttering economic fire but he makes some basic incorrect assertions and fails to understand the scope of the problem. First he believes in the "Technofix". The idea that the "Japanese" or some other people will make a timely discovery to advert a major environmental or economic disaster. While completely possible, it is unlikely and lulls people into a false sense of security. Also, the reason Iraq is so important is that it provides crude oil. The specific type of oil our entire world's infrastructure is built around. So if we all wake up tomorrow and the "Japanese" or the "Venezuelans" discover a way at getting at those Hydro carbonates there still would be a major problem in world energy supply. You can't transport natural gas far from the place of it's drilling and tar sand oil doesn't refine into a lot of gasoline.(normally). So if this article is right or if we have to make a switch to alternative fossil fuels besides normal oil we would need to tear down all of our existing infrastructure and build it up again around these new energy sources. We are addicted to oil, nothing else will satisfy it. Oh and there is no safe way of drilling natural gas clatherates. I'm with Zaptastic, where did the author get his information? I don't accept conspiracy theory on whim you know.